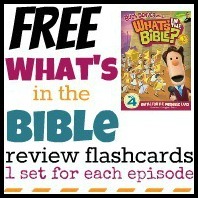 We've finished a set of review flashcards for What's in the Bible? DVD 5. Click on the link below to download for free. Also, check out all of our other free What's in the Bible? resources. Review Flashcards for DVD 1 can be found here. So, if you’re wanting a little extra review to go along with the What’s in the Bible? DVDs, I hope you’ll find these flashcards helpful. We’ll share the other sets of flashcards as I finish them. Sign up for free blog updates so you won’t miss out. Today's Questions: How do you help your children learn about (and from) the Bible? Hey! Found and followed you through Mom's Library Blog Hop. I just love your blog! This is a great resource for families using the DVDs. Do you share at the homeschool freebee friday link up? Thanks for sharing at Mom's Library! Interested in Advertising on A Heart for Home?